It's 8:30 a.m. on Friday, June 9, and I'm near the long defunct Portola Fountain at the southern entrance to downtown San Luis Obispo where Marsh and Higuera Streets meet near Highway 101. With a satisfying thud, I watch as two workers on a hydraulic platform guide the crane-suspended piece of artist Jeffery Laudenslager's monumental kinetic sculpture Olas Portola into place. The 26-foot-tall steel and titanium sculpture has been a long time coming. 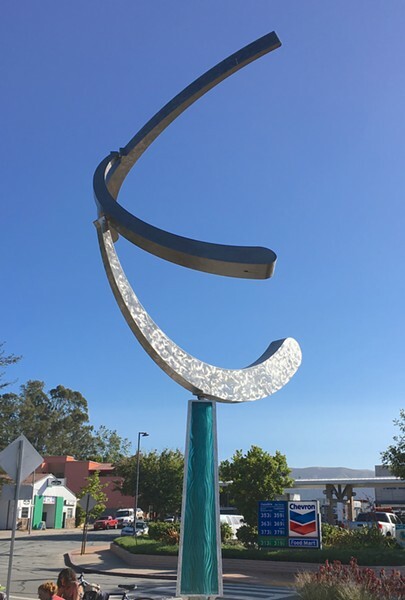 Laudenslager, 71, won the bid for the public art project eight years ago, but ever-vigilant SLO City officials had myriad concerns about the shiny, spinning, silver welcome to the downtown. Would light reflect into the eyes of motorists, causing distractions? Would it withstand Central Coast winds? Would its base be secure enough? WELCOME Olas Portola, (pictured left) whose lower glass shroud suggests water and three kinetic arms mimic waves, graces the southern entrance to downtown SLO. "Three years ago I was hired as a consultant by the city to see if I could bring two distrustful, frustrated parties to the table, and get past the logjam," local public artist Allen Root explains. "It's called Marsh Street for a reason. There's alluvial soil under here, but we poured 8 yards of concrete into the base of the fountain. It's not going anywhere." Laudenslager is based in San Diego while Root is well known to city officials as a local metalworker, public artist, and proprietor of design and fabrication firm Ferromobius. "Jeffery has two of these types of kinetic sculpture placed in Florida, and both survived a Category 4 hurricane," Root notes, adding that he was able to whittle down the city's 28 demands to just seven, which Laudenslager was able to accomplish. Hence, here we are, eight years later, with a beautiful new piece of public art in one of the city's most well traveled locations. Root and others work to strap the third and final part of the sculpture to the crane arm, but after lifting it into place, they realize it's upside down, so they try again, this time getting it right and securing it. The workers on the platform give the sculpture a gentle push, and suddenly it's spinning in a mesmerizingly glorious way. 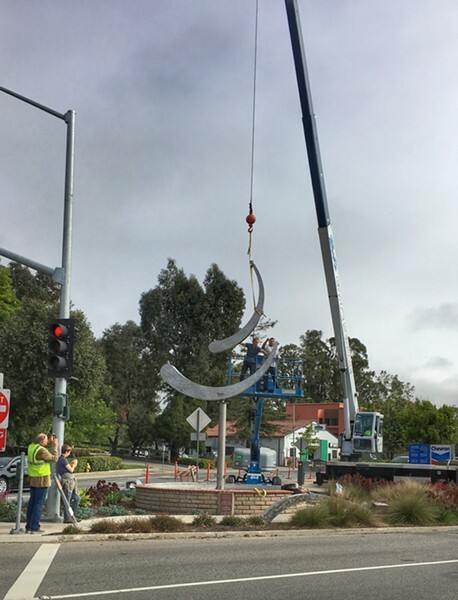 INSTALLATION Sculptor Jeffery Laudenslager's monumental kinetic sculpture Olas Portola is installed in SLO Town on June 9. "I have pieces in San Francisco, New York, Pennsylvania, Australia, Japan, Korea, England, Italy, and Germany," Laudenslager—with longish sliver hair, dressed head-to-toe in black, and looking every inch the artist—explains. "Almost all except my early stuff is kinetic." Laudenslager is an entirely self-taught sculptor who's been sculpting for 51 years. "I never got an arts education. I just started doing work after Vietnam at my daddy's suggestion," the veteran explains. "It seemed like a good suggestion." The sculpture's base is shrouded with bluish glass panels to suggest water rising from the fountain while the moving three arms suggest waves. The fountain will be filled with soil and landscaped to complete the effect. It's going to be truly spectacular, and dare I say worth the wait! "It took patience to get here," Laudenslager says, looking up at his creation, "but I'm just happy it's done finally." Glen Starkey is New Times' senior staff writer. Contact him at gstarkey@newtimesslo.com.